A powerful exploration of war’s effects on those who survive it, and specifically of the devastating ambiguities of “survivor’s guilt”—in a first novel by a journalist heretofore known for his 1997 Harper’s article “Prisoner of War” and other reports from such fronts as Bosnia and Chechnya. The story begins in Kurdistan under Iraqui attack, where “war photographer” Mark Walsh, wounded by artillery fire, has survived, though separated from his colleague and close friend Colin, and traumatized more than he knows. Neither the fatalistic acceptance of the Kurdish doctor who treats him nor his return home to New York and his lover Elena forestalls Mark’s increasingly debilitating disorientation and physical lassitude. Then, to Spanish-born Elena’s dismay, her grandfather Joaquin Morales learns of Mark’s condition, and arrives from Spain prepared to “purify” him—as, we learn in carefully spaced narrative disclosures, Joaquin had done during the Spanish Civil War. He had run an “institute” then dedicated to rehabilitating members of Generalissimo Franco’s notorious “blood squads”—and Elena has never forgiven “the Fascist Father Confessor.— As this harrowing tale moves toward an overpowering conclusion, Mark and Joaquin together—and Elena observing and loving them both—painstakingly accomplish conscience’s intricate balancing act: accepting responsibility for one’s mistakes while simultaneously forgiving oneself for living, and for being unable to save those who died. 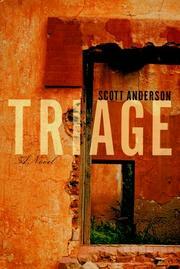 Triage is superbly conceived and plotted, and written in an understated prose that wrings great resonance from delicately placed simple sentences (as Mark laboriously makes love, “His back arched and Elena imagined blood spraying inside him”; as they lie in bed, “Elena heard the soft brush of his eyelashes against the pillow, knew he was still looking out at the night—). A magnificent homage to the method, subject, and spirit of another Scribner author, Ernest Hemingway, that reads, and feels like, a contemporary A Farewell to Arms; it really does.